Added Marigold Extract For Rich Yellow Yolks A high level of xanthophyll, a natural coloring agent derived from marigolds, produces deep yellow egg yolks. Exclusive Level of Marigold Extract For Rich Yellow Yolks A high level of xanthophyll, a natural coloring agent derived from marigolds, produces deep yellow egg yolks. 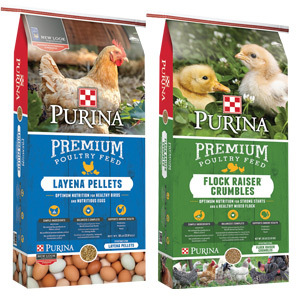 Essential Amino Acids Wholesome Eggs and beautiful feathering Enhanced with lysine and methionine to give birds the nutrients they need to produce plenty of wholesome and delicious eggs. Also promotes beautiful feathering. Key Levels of Vitamin A, D, E Strong Reproduction and Overall Health A high level of Vitamin A helps birds produce plenty of healthy chicks. Balanced and Complete Formula Freshly-ground grains from North American Farms Calcium, manganese and trace minerals for strong shells. Fortified with vitamins, minerals and essential amino acids.